Our first project was to create a fully-optimized website. The purpose of the site was to create awareness and provide important details covering all aspects of the week’s events. The homepage welcomes fans with a countdown to next year’s game and sports an eye-catching image slider highlighting memorable moments from the 2014 Game. Fans can purchase tickets directly online, while also allowing the MOH Bowl to gather readership statistics through Google Analytics. Much like any new business, marketing items were needed to set the tone when communicating with scouts, players and sponsors. Stationery pieces including business cards and letterhead were created, all thematically designed in consistency with the spirit of our Nation’s top military honor. As an inaugural event, it was imperative to stir up excitement throughout the Lowcountry. Strategically placed billboards were designed to draw attention to the upcoming game. 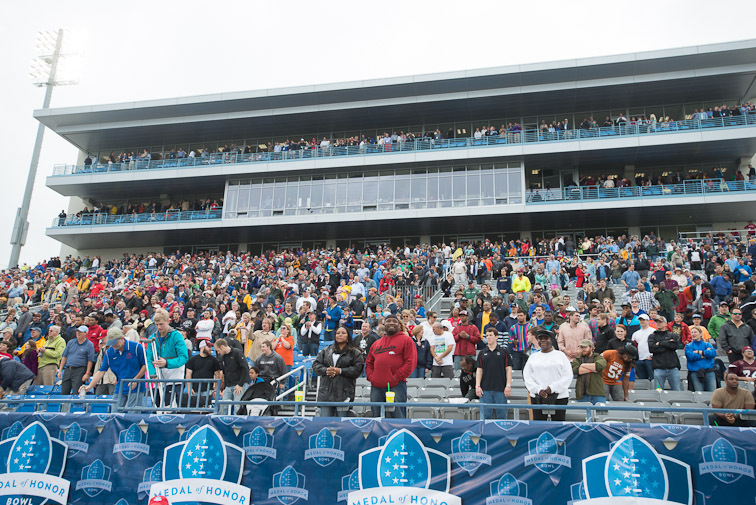 While the week culminated with the Medal of Honor Bowl Game, several other events took place throughout the week to hype up the fans and attendees. Sleek Programs were designed and printed on the Sharp MX 6240N for Saturday’s Bowl Game, as well as for Friday night’s True Blue Gala, which featured guest speakers Ed Marinaro, Heisman Trophy runner-up, & Major General James E. Livingston, USMC Ret. 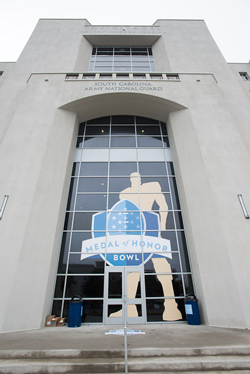 One of the most challenging tasks was transforming the Citadel’s Johnson Hagood Stadium into an atmosphere that fully invokes the spirit of the Medal of Honor. Luckily, our Roland printer and talented team were up to the challenge. With numerous companies supporting the event, custom signage was produced and then installed proudly throughout the stadium. As fans approached the gates, they were greeted by massive football player window graphics. These large format banners were so tall that a lift was required to properly install them. 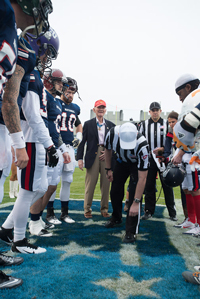 After a whirlwind week of events, the inaugural Medal of Honor Bowl was enthusiastically met with rave reviews from the players, coaches, scouts and fans alike. All of us at Bison are proud to have played a small part in helping shape this memorable event and are already hard at work on the 2015 Game!